To round off the season, for our April meeting we welcomed a record audience to Biggar Bowling Club to hear one of the great favourites on the Scottish Dance Band scene, Graeme Mitchell from Huntly in Aberdeenshire. But before our guests took the stage we were treated to a wealth of local talent from accordionists Fin Hope, John Weaks, Ian and Alex Graham, Charlie Todd, Brian Smith, Kyle Rowan, India Smith, Sheena and Emma Dickson, Elspeth Smith (Dumfries), Harry Tolson, Andrew Gibb, Fiona Paul, Fraser Hewitt and Jim Gold. On fiddle were Iona Cruickshank (Lumphanan), Tom Gold and Hannah Dickson, on tin whistle Willie Little and on shuttle pipes Thomas Smith (Dumfries). Backing these musicians we had pianists Fiona Paul, Keith Dickson, Molly Tolson, Jim Gold and Emma Dickson and drummers Tom Hope, James Dickson and Andrew Barrie. We also had a group of accordionists from the Scots Music Group (SMG) in Edinburgh, with their tutor Keith Dickson, who gave us two lovely selections. They were Alison Campbell, Alasdair Carmichael, Angus Creech, Liz Hall, Elspeth Porter, Ian Ramsay and Bill Wallace. Thanks for coming through – we hope you enjoyed the afternoon. But back to our guests. 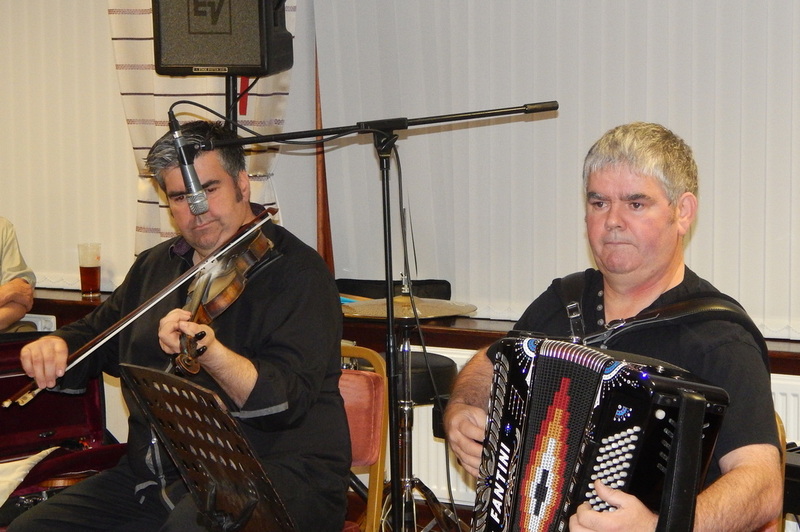 Graeme, on lead accordion, was accompanied by Gordon Duguid (second accordion), Neil MacMillan (piano), Brian Cruickshank (bass guitar) and Duncan Christie (drums). Graeme recalled his first guest spot at Biggar in the Clydesdale Hotel as a youth of seventeen, in October 1980. He was superb then and the intervening years have done nothing but enhance the standing of the band. Their two spots were filled with beautifully executed dance music sets with all the swing and lift we’ve come to associate with the band. Thanks boys and also to the mums for the half-time buffet, Alex and Nettie at the BBC for hosting us, and the whole Committee, particularly Alan Gardiner and Joan Gold, for all their hard work over the season. This brings the current season to an end. We resume on Sunday, 13th November with the Duncan Hutchison SDB in Biggar Bowling Club at 2 p.m. See you there. ​Sunday, 13th March, saw a capacity crowd at the Biggar Bowling Club to hear ‘The Full Scottish’ with Nicky McMichan and John Burns sharing lead/second accordion, Marie Fielding (deputising for Maggie Adamson) on fiddle, Dennis Morrison on piano, John Sinton on string bass and Graham Crichton on drums. It’s a rare treat to hear a full six piece band these days and both local players and listeners made the most of the opportunity by turning out in droves. Local accordionists were Charlie Todd, Ian Ramsay, Fin Hope, Kyle Anderson, Fiona Paul, Harry Tolson, Anna Scott, India Smith, Davy Millar, Elspeth Smith, Darroch Wood, Newby Park, Sheena Dickson, Pat Scott, Emma Dickson, Allan Smith, Janet Graham, Ian Graham and Duncan Hutchison. On fiddle we had Gilbert Logan and Tom Gold. Keyboard players were Fiona Paul, Alan Gardiner, Declan McGarva, Molly Tolson, Keith Dickson and Jim Gold and on drums were Tom Hope and James Dickson. On tin whistle was Willie Little and on mandolin Ian Murray. The guests provided us with the authentic sound of Scottish Dance music as it used to be. Bandleaders Nicky McMichan, originally from Lochmaben but now resident in Lugton in Ayrshire, and a former pupil of Keith Dickson and John Burns from Kilsyth, the 1999 winner of the Senior Scottish at Perth steered us through all the various tempos, including some classic strathspeys. Thanks to Alex and Nettie at the Biggar Bowling Club, to the KODA mums for a splendid half-time buffet and to Alan Gardiner and Joan Gold for organising a very full afternoon’s entertainment. ​We thought our attendance had peaked for the season at our January meeting but we were wrong. February saw an even bigger turnout of listeners and far more players. So many in fact that we had to run on for an extra hour (which is not a problem when we start at 2pm) but when the ‘local’ entertainment was being provided by Keith Dickson’s pupils in a pre-Northern Ireland Open Accordion Championships warm up consisting of soloists, duets and groups playing everything from Classical to Pop, and Scottish to Continental no-one was complaining. Keith’s pupils and group members performing on accordion were Kyle Anderson, Rose Cursiter, Emma Dickson, Fin Hope, Kyle Rowan, Anna Scott, Clelland Shand, Inver Shand, Brian Smith, India Smith, Kyra Smith, Harry Tolson and Darroch Wood; on piano Declan McGarva, Alan Rowan, Blythe Shand and Molly Tolson and on fiddle Hannah Dickson. Also performing on accordion were Sheena Dickson, Jim Gold, Davy Millar, Newby Park, Fiona Paul, Allan Smith and Charlie Todd; on piano Keith Dickson and Fiona Paul; on fiddle David Corner and Tom Gold; on drums Ian Graham, Tom Hope and Geordie Shiels and on vocals Shelley Clark. ​Making his debut as guest was another of Keith’s pupils, accordionist Fraser Hewitt from Quothquan, accompanied by Emma Dickson on piano. Together they provided a contemporary programme featuring a variety of styles and tempos. Again, everything from King Robert the Bruce to Czardas and from Lament for Red Iain to Nocturne in C# Minor. Altogether an exciting and well executed performance. Thanks to the KODA mums for their usual outstanding buffet at half time. January saw a permanent change to our start time at the Biggar Bowling Club to 2pm. It may have been a rather dreich afternoon outside but there were plenty of musicians on hand to make it an enjoyable afternoon indoors. Our guests were the Janet Graham SDB comprising Janet herself on lead accordion, Derek Hamilton on second box, Andy Kain on fiddle, Iain Wilson on keyboard and Gordon Young on drums. Janet was accompanied by a large number of her fan club – good to see some new faces amongst us. The band played a wide variety of tried and tested tunes which kept the audience happy and Janet interspersed the playing with a poem and a few jokes and stories. Well done for an excellent afternoon’s entertainment. Local entertainers present were accordionists Charlie Todd, Fiona Paul, Fraser Hewitt, Alan and Blair Gardiner, India smith, John Weaks, Rose Cursiter, Fin Hope, Allan Smith, Kyle Rowan, Jim Gold, Sheena and Emma Dickson and Ian Ramsay. On fiddle were Emma Gardiner, David Corner and Gilbert Logan and on keyboard Fiona Paul, Alan Gardiner, Fraser Hewitt, Keith Dickson and Jim Gold. Drumming was provided by Tom Hope, Geordie Shiels and Andrew Barrie and Ian Murray was on guitar and mandolin. It was good to see the ‘WAGS’ taking a solo spot with Emma Gardiner giving us a couple of lovely selections on fiddle and Sheena Dickson doing the same on the accordion. Fraser Hewitt, next month’s guest, gave an excellent rendition of a classical piece, The Carnival of Venice. We also celebrated Keith Dickson’s recent 50th birthday with a lovely cake made by club member Hannah Jamieson. Thanks once again to the Biggar Bowling Club, the KODA mums for the excellent buffet and to Alan Gardiner and Joan Gold for steering us faultlessly through the afternoon’s programme. It's mine, all mine ! Our December meeting on Sunday, 13th took the form of a Club Night without a guest artiste. On reflection that’s probably a bit of a misnomer when your local artistes belong mainly to Keith Dickson’s School of Music and as if things weren’t normally first class this time he had persuaded several new faces to come along. On accordions during the evening were Charlie Todd, India Smith, Fin Hope with dad Jamie also on accordion, Harry Tolson, Alan Gardiner, Andrew Wight, Duncan Hutchison, Emma Dickson, Rose Cursiter, Jim Gold, Brian Smith, Fraser Hewitt and for the first time in many years Keith’s wife Sheena Dickson playing lead accordion. Additionally, early on in the evening, we had a group Keith calls the ‘Thornhill Accordion Group’ consisting of accordionists Mitch Peacock, Anna Scott, Elspeth Smith and Darroch Wood and keyboard player Declan McGarva who gave us 3 nicely arranged Christmas numbers. On fiddle were Emma Gardiner, Gilbert Logan and Tom Gold and on keyboard Keith Dickson, Molly Tolson, Rose Cursiter, Jim Gold and Alan Gardiner. David Corner played a couple of sets on melodeon and drumming was in the hands of Tom Hope, Andrew Barrie and Geordie Shiels. A different dimension was provided by two very capable singers, namely John Caskie from Dumfries and Shelley Clark from Sanquhar. Appearance wise this time it was John who stole the show, wearing a standard two-piece suit but in Christmas colours with white snowmen and green Christmas trees on a bright red background. (John’s tailor is to be congratulated on his sense of humour). Thanks to everyone who participated to make it such a fine evening and to the KODA mums who once again provided a super buffet at half time. Argyllshire to be with us. Before the boys took the stage we had a wealth of local talent to entertain us. On accordions were Fin Hope, Charlie Todd, India Smith, Emma Dickson, Kyle Rowan, Rose Cursiter, Fiona Paul, John Weaks, Davy Millar, Jim Gold and Janet Graham. Fiddlers were Rosaidh McKintosh, Tom Gold and Hannah Dickson and on keyboard were Alan Gardiner, Alan Rowan, Fiona Paul and Keith Dickson. On drums were Geordie Shiels, Tom Hope and Andrew Gibb with David Corner on concertina. Additionally we had 11 accordionists – Angus Creech, Pat Drewitt, Rachel Frith, Iain Gotts, Liz Hall, Billy Higgins, John Inglis, Alistair MacIntosh, Elspeth Porter, Ian Ramsay and Bill Wallace – from the Edinburgh based ‘Scots Music Group’ - who collectively performed three Phil Cunningham compositions with piano accompaniment provided from Alan Rowan. Archie and Alec’s two spots amply demonstrated the lovely West Coast style with lilting pipe marches and Gaelic waltzes interspersed with all the other tempos – and all without a dot of music in front of them – Bobby MacLeod and Alasdair Downie would be proud to know that their tradition continues. Thanks to the lads for an excellent evening and also to the KODA mums for the superb buffet and to Alec and Nettie at the Biggar Bowling Club. Biggar Accordion & Fiddle Club had their first meeting of the new 2015/2016 season on Sunday 13th September and enjoyed a good turnout of both players and listeners alike. Playing accordion were Finlay Hope, Fiona Paul, David Millar, Fraser Hewitt, Newby Park, India Smith, Jim Gold, Allan Smith and Alan Gardiner, with David Corner entertaining on concertina. Fiona Paul and Keith Dickson played keyboard with Tom Hope and Andrew Gibb on drums. The star of the show was however little Emily Gold (3 years old!) who sang a lovely song unaccompanied. Guest artistes for the evening were David Kennedy and his Scottish Dance Band. Fresh from recording their second “Take The Floor” session back in May they enthralled the audience with a great selection of material, full of energy and drive. All in all, a great start to the new season. Please note that there is no club meeting in October.